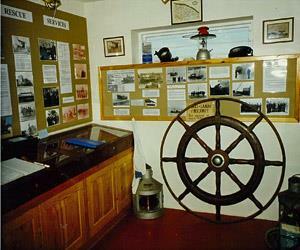 Mundesley Maritime Museum01263 722068work MuseumDisplays include lifeboat exploits, ship wrecks, fishing industry, maritime artefacts and locally discovered fossils. The former railway branch lines 1898-1964 are also depicted. The 1st floor has been reinstated as a coastguard lookout of the 1930/40 era containing tide clock, fog horn and powerful binoculars, also modern equipment (radar, VHF radio) as the NCI keeps a visual watch providing a service. Displays include lifeboat exploits, ship wrecks, fishing industry, maritime artefacts and locally discovered fossils. The former railway branch lines 1898-1964 are also depicted. The 1st floor has been reinstated as a coastguard lookout of the 1930/40 era containing tide clock, fog horn and powerful binoculars, also modern equipment (radar, VHF radio) as the NCI keeps a visual watch providing a service. Please note: The Museum is manned by volunteer stewards. We do have difficulty in filling all the slots and regrettably sometimes the Museum may not be open. Take the B1159 from Cromer to Mundesley or take the B1145 from North Walsham to Mundesley and follow beach signs.